Perhaps you guessed from the title that today, we will discuss different words that can be used to substitute for said. In many instances, said can be, and often is, the right word for the job. What happens when you need your character to not be as active, but to present their story in a more passive manner. This is when you will need to find other words to use in place of said. Try this for size. “You are a dolt,” she said. Blah. Now, this for comparison, “You are a dolt,” she exclaimed. or better still, “You are a dolt,” she screamed. We now know that she, whomever she may be is angry at someone. Just the subtle difference in one word in your sentence can convey a whole new meaning. Here are some words you may be able to substitute for said when the need arises. Acknowledged, shouted, complained, admonished, demanded, moaned, mumbled. 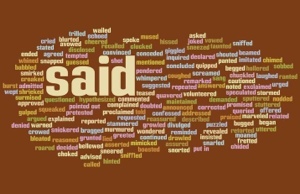 What words can or do you use for said? I will work on the text size, but cannot do anything about photo resolution I am afraid. Thank you for stopping by and commenting. Hope to see you again soon.